A local news story comes from Palm Harbor, Florida where a couple shared their middle-of-the-night experience with the local NBC news station. The woman and her husband were asleep when, in the middle of the night her iPhone 6 Plus began igniting on her nightstand. “My face was so close to the phone when it immediately went up in flames it woke me up, luckily I’m a light sleeper… it literally blew flames out the side of the phone,” the woman told NBC. Luckily her husband, Kyle, woke up and used a shirt to smother the flames. She said if she didn’t catch it as quickly as she did, her curtains could have caught fire. Just down the street, another iPhone 6 Plus owner told the same news station that his phone wouldn’t charge on Monday night and to his surprise, he found the phone’s battery totally swollen the next morning. Although, the second guy’s phone didn’t ignite. The woman’s phone was two and half years old, so a battery failing like that wouldn’t be impossible. The iPhone 6 Plus hasn’t been widely reported to ignite like this, but there have been very few cases, including the two aforementioned situations in Florida. 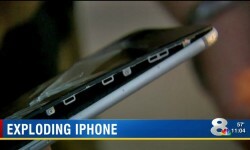 An Apple Spokesperson told NBC: "Thank you for bringing this to our attention. We are looking into it." Apple is already on top of the case and has already promised the woman a replacement. A $750 hold has been placed on her credit card and once she returns the charred iPhone, Apple would release the hold. As a reminder, don’t sleep with your phone on your bed, as the risk of battery failure is entirely plausible due to heat-buildup. Make sure your phone, whichever one it may be, charges in a well ventilated area and if your battery is noticeably swollen or your phone has a bulge, the battery should be replaced immediately.